The National Executive Committee (NEC) of the APC said it would take final decision on the party’s executives’ tenure extension on Monday. National Chairman of the party, Chief John Odigie-Oyegun, announced this on Wednesday in Abuja at the end of a three-hour meeting between governors elected on the party´s platform and the National Working Committee (NWC). The party had on Tuesday, constituted a 10-member technical committee headed by Gov. Simon Dalung of Plateau to advise its leadership on the way forward on the tenure issue. "´´I want to say to you with absolute satisfaction and pride that all the issues that you have been commenting on has been completely and totally resolved,’’ Odigie-Oyegun said. ´´The Chairman of the technical committee has reported that his report will be ready latest this evening or by the very most, early tomorrow morning. ´´This report will be placed before NEC on Monday and appropriate decision will be taken and thereafter, we shall announce to you the further steps we are going to be take,´´ he said. 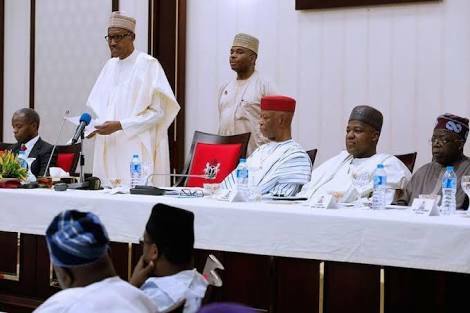 The Nation reports that Governors elected on APC platform, had at a meeting with Buhari on Tuesday unanimously agreed that the party should hold a congress to settle the extension issue and others.